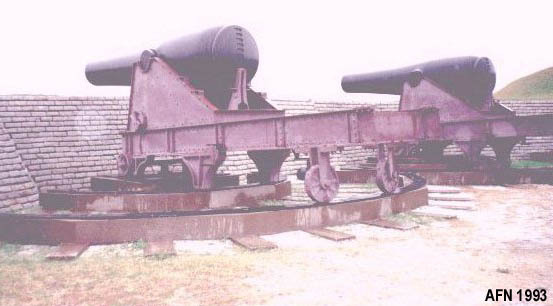 Photo: Fort Moultrie, South Carolina, 1993.
or check us out on Facebook for all of our photos! Welcome to North American Forts.com! The purpose of this website is to gather basic information on every known military and civilian fortification built in the United States, Canada, and their territories, and to attempt to hyperlink together all known related websites found on the internet in order to provide more information than we can provide on this site. Forts are catalogued by state, province, or territory, in geographic progression, in a gazetteer format. An alphabetical index for each page is provided at the top of each page. There is NO master index for this website. Each fort is identified with national flags of ownership and dates-of-service for at-a-glance referencing. This project is a continual work-in-progress! If you know of any forts that we may have missed or overlooked, or have additional information or corrections to the forts we do have, or have a website that we may link to, or want to report a dead link, please let us know by contacting us via e-mail. Thank you, and enjoy! Special thanks to many individuals who provided information and corrections. Our gratitude goes out to all. We are particularly indebted to Jim Geisler for providing data on pioneer settlement forts of the Ohio River Valley; to Ted Cook for data on western frontier outposts; and to Marshall Sitrin for many corrections throughout. Thanks also to Mark Berhow, of the Coast Defense Study Group, for his compiled list of "Modern American Seacoast Defenses, 1890 - 1950", and to the late Robert Zink, also of the CDSG, for his "Forts of Wherever" series, and his helpful guidance towards this project. Other individual credits appear within the listings where appropriate. We also wish to thank our parents, Pierre and Irene Payette, for all those cross-country summer vacations in the 1970s and '80s which provided the seeds of our interest in American History, and also for their recent travels which has been a source for many brochures, books, photos, and other materials from many places which we have yet been unable to visit in person. This site does NOT include modern (post-1930) Canadian military or RCMP installations except those that were associated with coastal defence. The year 1956 is regarded as the end of Canadian coastal defence. This site DOES include ALL Hudson's Bay Company trade posts, regardless of date, as found in the HBC Archives (online version) from the Government of Manitoba. HBC Stores are NOT included. This site does NOT include Reconstruction era (1866 - 1877) U.S. Army posts and garrisons in the American South. This site does NOT include any military prisons, prison camps, aviation fields, hospitals, or cemeteries, nor any Federal, State, or Provincial armories or drill halls, except those associated with a listed fort (with a few exceptions). After all of the above, if you don't see a listing anywhere for a particular fort, then we have NO information on it. We are not holding back anything from our files. If you know something we don't, send it to us! This website is NOT databased. Therefore DO NOT ask us to provide for you a list of a certain category of fort by timeframe or type, or a list of visitable sites. We do NOT have or list information on personnel or military units garrisoned at any particular fort. A search through national, state or provincial, RCMP, or other military or genealogical archives should provide that information to you. Maps used in our location research include official state and provincial highway maps, American Automobile Association sheet maps and the AAA atlas, and the DeLorme series of topographic state atlases. We are not responsible for the content, nor for any inaccuracies, that may be found on any outside third-party websites that we have created links to throughout our website.